Int|AR Journal Volume 5 was launched in Europe this summer. Exploring the theme of “Resilence and Adaptability,” this issue emerged out of dialogue between the Department of Interior Architecture and the Division of Liberal Arts. Editors in chief Markus Berger (Associate Professor, Interior Architecture) and Liliane Wong (Professor, Interior Architecture) and Graphic Design editor Ernesto Aparicio (Senior Critic, Graphic Design) were joined for this issue by guest editor, Damian White (Associate Professor, History, Philosophy and Social Sciences). The launch of the journal in the U.S. will take place this fall. 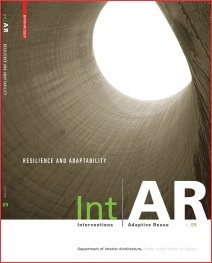 The journal on Interventions and Adaptive Reuse (Int|AR) addresses issues of interior architecture and adaptive reuse by promoting creative explorations of this subject through exemplary works in which sustainability is one important facet. Its domain encompasses issues of preservation, conservation, alteration and interventions in the field of architecture and interior studies and practice, but also in the realms of urban and landscape design, and their repercussions in the history and theory of architecture, urbanism, art and design. Each issue of this publication has a particular focus. By exploring distinct viewpoints and approaches to these themes, and by selecting contributions through a peer-review process, Int|AR is conceived as an engaging forum in which different and possibly controversial views are expressed. Int|AR is the official publication of the Department of Interior Architecture. It is edited by members of the faculty and supported by the Department, its Division, the College and its Editorial Board.